A groundbreaking initiative to better understand the impacts that trawling may have on the seabed entered an important second phase this week when the research vessel, Ellen Khuzwayo, left Cape Town for a week-long survey of the trawl grounds known as Karbonkel. Karbonkel is situated on the continental shelf, offshore of Port Nolloth and three “trawl lanes” on these grounds have been closed to trawlers for a period of one year. 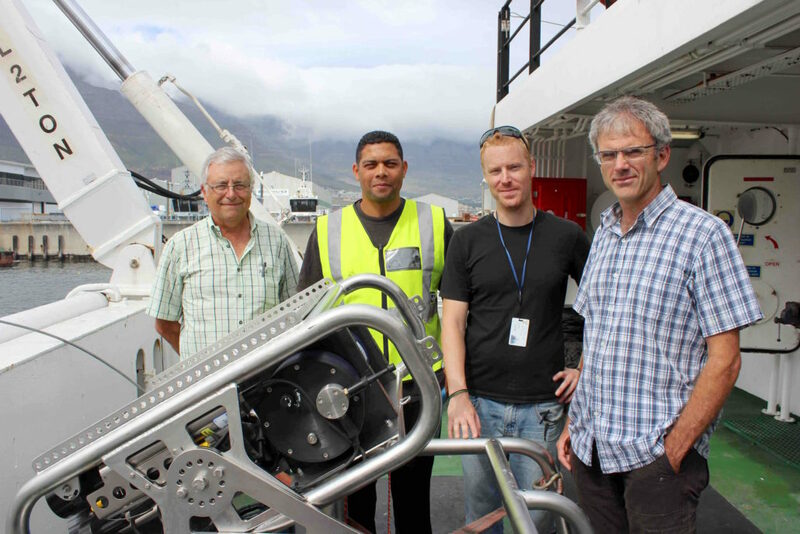 The multidisciplinary team of scientists and electronics technicians on board the Ellen Khuzwayo will gather images and samples of the seabed using a submersible camera and a benthic grab. They want to determine whether the closure of the trawl grounds has had a visible impact. “We will be surveying life on the seafloor to see how the lanes that have been closed to trawling are responding to the lack of disturbance,” explained Professor Colin Attwood, chief scientist on the voyage. Macrofauna are small marine mammals, including snails, worms, clams and other thumbnail-sized creatures that live and feed in the sediments on the sea floor. Macrofauna were collected and analysed in exactly the same trawl lanes last year, but the difference is that the lanes had been recently trawled. The scientists on board Ellen Khuzwayo are eager to see whether there is a difference in the number and type of species photographed and collected now that the lanes have been closed to trawling. Their work represents a unique five-year collaboration between SADSTIA, the Department of Agriculture, Forestry and Fisheries (DAFF), the University of Cape Town and the South African Environmental Observation Network (SAEON). The goal of the collaboration is to obtain a scientific understanding of the environmental impact of hake trawling in South Africa. Dr Johann Augustyn, secretary of SADSTIA, explained the rationale behind the experiment: “As an industry, we are concerned about our footprint,” he said, referring to the impact of fishing activities. SADSTIA is currently engaged in a rigorous process to renew its certification with the Marine Stewardship Council (MSC). South Africa’s deep-sea and inshore trawl fisheries were certified by the MSC as “sustainable and well managed” in 2004 and again in 2010; if the current assessment is favourable, MSC certification will be extended to 2019. Since 2004, the MSC has stipulated that SADSTIA should assess and mitigate the impacts that trawlilng has on the seabed and the organisms that live there. SADSTIA has gone to great lengths to meet this and other conditions of MSC certification and the five-year seabed recovery experiment forms part of this effort. Not only have SADSTIA’s members agreed to close part of an important trawl ground, they have also arranged for two senior technicians to participate in this year’s survey. 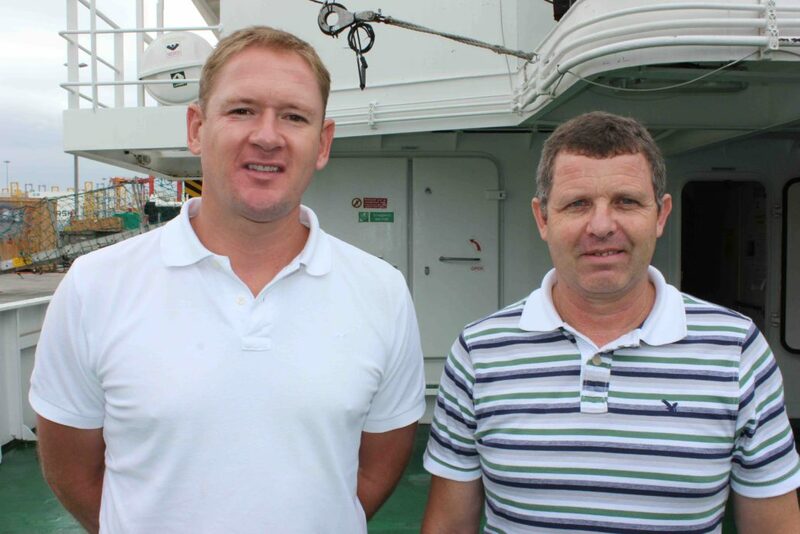 They are Driaan Pretorius, engineering manager with Viking Fishing, and Jean van der Merwe, fleet electronics manager with Sea Harvest. “We’re quite excited about the experiment,” said Russell Hall, Sea Harvest’s trawling division manager. Driaan Pretorius assisted the scientific team in 2014 and is contributing his time and expertise again this year. Also on the scientific team this year is Dr Kerry Sink, the head of the South African National Biodiversity Institute’s (SANBI) Marine Programme, and a long-time advocate for a system of offshore marine protected areas (MPAs). Dr Sink is excited by the fact that the team will deploy the submersible camera on Child’s Bank, a seamount located adjacent to the Karbonkel trawl grounds. “Child’s Bank has been identified as a focus area for offshore protection, but on this survey we will see it for the very first time,” she said. The Ski-Monkey submersible camera has been modified to allow it to collect images from Child’s Bank without damaging the hard corals and benthic species that are known to occur there. Offshore MPAs are entrenched in the Phakisa programme – government’s initiative to unlock the economic potential of South Africa’s oceans – and SADSTIA has worked with scientists and conservationists since 2006 to identify the most suitable areas for an offshore MPA. A multidisciplinary team of scientists and technicians is involved in the seabed recovery experiment. 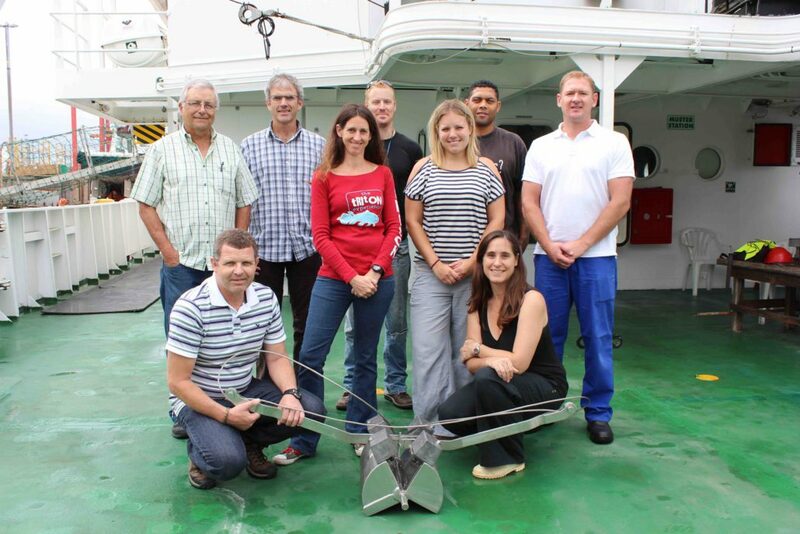 Pictured here are (back row): Dr Johann Augustyn, secretary of SADSTIA; Professor Colin Attwood of the University of Cape Town; Dr Kerry Sink, head of SANBI’s Marine Programme; Dr Charles von der Meden, a postdoctoral researcher with the South African Environmental Observation Network; Karen Tunley, a PhD student at the University of Cape Town; Hermann Engel an electronics technician with the Department of Agriculture, Forestry and Fisheries; and Driaan Pretorius, engineering manager of Viking Fishing. In front, holding the benthic grab that will collect samples from the seabed during the voyage are Jean van der Merwe, fleet electronics manager at Sea Harvest, and Dr Lara Atkinson, an offshore marine scientist with SAEON.